In this exclusive interview with mrbrown, the father of 3 shares his family’s story on losing their helper of 14 years to cancer and the grief that came with it. Our interview with mrbrown was not what you expected it to be. There was no Kim Huat, no cameras, no action. It was just mrbrown in his true self and sharing with us the reality of how hard parenthood and the challenges it brings. There is nothing sugar-coated or simplified, and that is what made our chat with Singapore’s most-loved author so authentic. 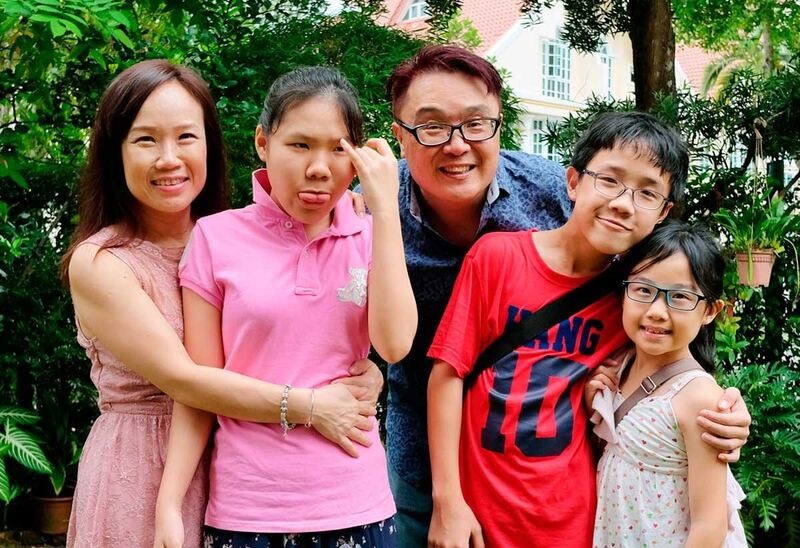 A loving father to his three beautiful children – Faith, Isaac, and Joy, mrbrown and his wife discovered their first-born child Faith is autistic when she was just a year old and it was at that time when they employed their first helper, who had stayed with them all these years. When they lost her last year to Stage 4 cancer, it came as a huge shock on the family. “It was so sudden, it was like losing a member of our family,” says mrbrown. Having taken care of all 3 of mrbrown’s children, it was indeed tough to receive such news and upon confirmation from the doctor, it was advised that they sent her home immediately. “I remember it was a week before Chinese New Year. I came back from my trip and that very day, she was discharged and I booked a flight for her right away to not risk it,” he adds. With just 5 percent changes of survival with chemotherapy, mrbrown and his family knew that they needed to send her home so that she can be with her family in those trying days. But how do you say goodbye who’ve done so much for you all these years? “We had to deal with it as a family. We’ve been with her for 14 years and in the span of 3 days (from the time she complained of pain to the time she was checked at the hospital and discharged), she went back. So we had to bid goodbye in that space of time. All of her other items were still in our home when that happened,” describes mrbrown. To make it easy for their helper, mrbrown and his family gave her additional money to help her cope with the medical expenses back home. Three months later, she passed away. “On one hand, it’s painful, especially seeing our youngest cry non-stop. But children are very resilient too. Never underestimate how resilient they are. They are tougher than their parents,” expresses mrbrown. “When they spoke to her, she was so weak. I tell you, on the phone, this is a woman who is dying of cancer, and bedridden, and on that phone call, all she was worried about are my kids. She told Joy, “Make sure whoever Papa gets to look after Faith is good. Don’t let anyone bully your sister. She’s still worried – maybe ask Papa to install a CCTV camera or something.” This is how close she is to us and the upper most thing in her mind is please make sure Faith is taken care of. We are blessed by having her in our lives, and we’d like to think that we too have been a blessing to her and her family all these years,” he says. Just like any other siblings, do they have sibling rivalry, and how do you deal? Yes, they do, and sometimes they need to fight it out, or sometimes you need to step in to put a stop to it. You have to teach them to resolve their differences on their own – but children will fight. But, they’re really close, and we always say that they’re best friends when they’re not trying to kill each other. So you need let them be who they are, not mould them into something they’re not. Their growing environment must be very different then from their peers? Yes it most definitely is, because they are living with an autistic sister. They are however very protective over her. Just the other night, Joy walked into our bedroom at 11pm to tell us that Faith had pass motion in bed and that she was being cleaned up by our helper in the most calm manner. It didn’t occur to me then, but if you’re a child who’s not used to it, she would’ve freaked out, but she was so casual about it. It’s good that they are taking this in their stride – they’ve been sharing the same room (all three of them) since they were young. What is a typical weekend plan for mrbrown and family? There is no plan! (laughs) We sleep in, we drop Joy for her tuition and fetch her. We spend time with one another and go to church on Sundays! That’s it! To find out more on mrbrown’s fatherhood journey, check out Singapore’s Child June issue (p. 36) for more. What are your thoughts on dealing with loss? Leave with us a comment down below.